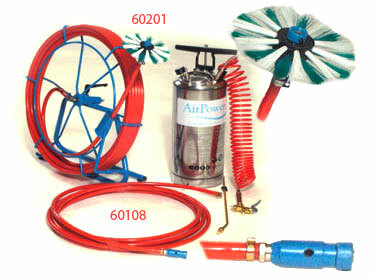 Disinfection fluid pressure tank, spiral hose (4m), handle, disinfection cartridge with 8m-hose, disinfection reel (20m). Disinfection and washing of air ducts. The tank can be connected to Master JR/SR brushing device central units. When using the tank with a brushing device, the brush head is equipped with a disinfection head 60201 or 60202. Air pressure for the tank can be generated either manually by using the integrated pump or with an external air compressor through an air valve. The disinfection cartridge can be used for manual disinfection and washing of small ducts. For centralizing of the cartridge a separate concentrator brush can be used. Volume of tanks is 10 litres. The tank is made of acid proof steel, the handle of brass and the cartridge of plastic and brass.